Any one who has been reading my blog knows by now that I am in the process of moving my stamp room from a larger room to a smaller room. Today is my assigned day to post for the Technique Junkie Design Team. And since I have "enough of my supplies" moved and settled into my new stamp room, I was able to make one card. I have no ribbons moved, no fibers moved, very little in background paper, two paper cutting tools but only one place to cut with it. The new counter top is still loaded with stuff to sort and put away. Our neighborhood is sponsoring a multi family garage sale this next weekend. So I am also trying to get ready for that with all of the things i no longer have room for in my new stamp room. Going from a 10x12 room to an 8x9 room means I cannot keep some things no matter what. So I have to decide all of that too. 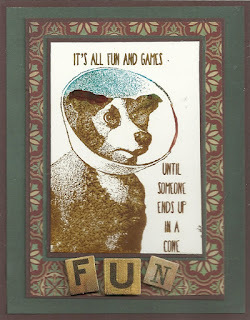 So this cute doggie stamp is called "Fun and Games" and you can find it here -- http://techniquejunkies.com/fun-and-games/. What have you done lately to get inky?